At Johns Hopkins All Children’s, nurses are the lifeline of our community and we’re honored to have a new leader to support our outstanding nursing staff. Johns Hopkins All Children’s Hospital named Melissa Macogay, M.B.A., B.S.N., R.N., C.C.R.N.-K., N.E.-B.C. as vice president and chief nursing officer this week. A registered nurse for more than 19 years, Macogay started as a nurse in the pediatric intensive care unit (PICU) at The Johns Hopkins Hospital in Baltimore, Maryland. 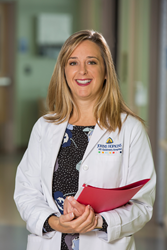 She joined Johns Hopkins All Children’s in 2008 and served in multiple roles including, interim chief nursing officer, director of the PICU, surgical neuroscience unit and dialysis as well as senior director of nursing for the Institute for Brain Protection Sciences.